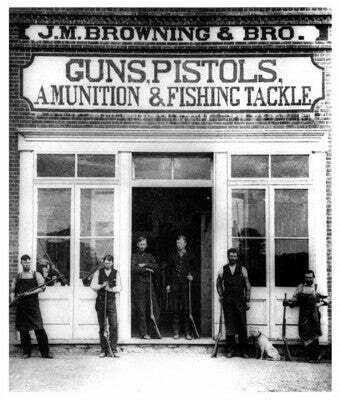 John Moses Browning was born in 1855 in Ogden, Utah, and spent a great deal of his growing up years at this father's side in his father’s store and gun repair shop. In 1878, with encouragement of his father, he designed and began production on what he felt was a superior single shot rifle. He was right. And after a production run of about 600 rifles he was sought out by Winchester Repeating Arms and soon his ingenious falling block rifle became the 1885 Winchester. This began a string of legendary products he licensed to Winchester including the Model 1886, Model 1892, 1887 shotgun, Model 94 and Theodore Roosevelt’s favorite, the 1895. There were many, many more of his creations that became Winchesters. By the turn of the century he was licensing his inventions to other gun makers and had already done his ground breaking work with fully automatic firearms and self-loading pistols – like the BAR, the M2 machine gun, the 1911 pistol . . . the list goes on -- which are all now the stuff of legend. However his legend and his company have continued. The Browning Brand has come to represent “The Best There Is” in firearms and outdoor products, each year adding new innovations, launching new products, and doing more for our customers – essentially just following the great tradition of innovation started by John Browning. 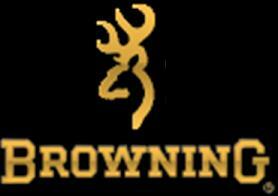 In the 1970s Browning added a symbol, the Browning Buckmark logo, that has come to represent all that John Browning valued. The future looks bright for our legendary brand. With Browning playing a strong role in the firearms market over the years, They now are a dominant player in social media, with hundreds of thousands being influence by there Instagram and Twitter feeds, and with there industry best 2.3 million Facebook followers. Today, Browning is headquartered a few miles east of Ogden in Morgan County. They are surrounded by mountains and are able to enjoy the hunting, fishing and plentiful outdoor activities found right there at one of the most beautiful places in the west. When In stock black nickel plated shell cases offer improved reliability and feeding. Brass World would like to take this opportunity to express our appreciation for your support of Us,Browning products.Reloading and the Shooting sports.